It's always a pleasure reading about the underdogs who have fought against their inherited destiny to survive and that too with dignity. Nothing fascinates us more than seeing people rise up from the abyss of uncertainty to scale heights of success. 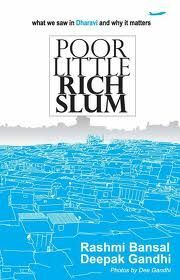 Poor Little Rich Slum by Rashmi Bansal and Deepak Gandhi is very different from her previous books. This book is all about the struggles in Dharavi (Asia's largest slum) and their little victories. Rashmi's earlier books too were about successful people but this one is not so much about success than about survival. Much has been written about Dharavi and has even been immortalized in movies but the concept of writing about the entrepreneurs from the slum who used their ingenuity to find opportunities in literal filth or otherwise is pure gold. There is always an element of curiosity when is comes to the narrow lanes of Dharavi but at the same time there is a sense of admiration for the "heart" of the slum that no one cares for. Divided into four sections called "Dharavi, What Ees? ", "The Incubator", "The Cauldron Of Change" and "The Future", each deals with stories about people who have defied odds to show ingenuity and/or marched on the path of selfless passion. The entire book seems to be a guided tour of Dharavi conducted by Tauseef who runs a local tourist business. Not all stories are about commercial success like that of Jameel Shah or Praveen Sakpal; there are myriad enterprises that look beyond money like SHEHA or the PUKAR Foundations. Poor Little Rich Slum does not give a lopsided view of what Dharavi is all about. It is well balanced by stories about rise in stature (economically) and rising as a human. In a nutshell it all about what the book rightly mentions, "Dharavi is not just a physical location, it is an emotional entity." I am not one who glorifies slums and I feel that we cannot justify their existence by writing about the success stories emanating from them. The human spirit of survival need not find home in slums; it can be found anywhere. And if the writers meant we need more slums like Dharavi when they said, "Dharavi should be celebrated and replicated", then I beg to differ. Slum is not the answer; it is the question that needs to be answered in the first place. The writing is simple yet lucid and would have been totally drab if not for the brilliant photographs by Dee Gandhi. This book is for anyone who complains that life is unfair and that it’s their destiny to be downtrodden. Dharavi teaches the spirit of the unbeatable mind and unquenchable thirst for rising from filth and reaching for the sky. I am sure that there are a million other stories with a "human" touch to them but for that you will have to visit Dharavi and find out. 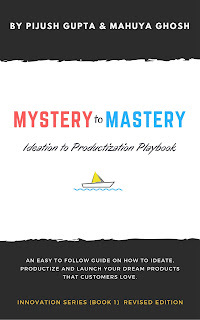 This book is a start so we need to do our bit and get to the bottom of it. Go ahead! Get Inspired! This review is a part of the Book Reviews Program at BlogAdda. Participate now to get free books!